Pennsylvania Women Work is hosting a spring fundraiser to benefit our many programs that help unemployed women get back on their feet! Whether they've been dealt a bad hand or a full house, many single mothers find themselves gambling with their futures. Education is expensive, and minimum wage jobs just don't pay the bills. Pennsylvania Women Work strives to help those women in career transition and equip them with the tools they need to succeed with our FREE programs and services. Now we ask you to help us by betting on brighter futures for Pennsylvania women. You won't want to miss the fun and excitement at PA Women Work's 2nd Annual Casino Night. Join us for an evening filled with music, food, prizes, cash bar and complimentary casino games. For more information contact Kristin Ioannou at 412-742-4365 or via email. 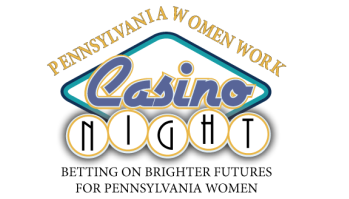 Help us bet on brighter futures for Pennsylvania women by becoming a Casino Night sponsor. Sponsorship levels range from $500 to $5,000. Your financial commitment will enable PA Women Work to continue providing services to the most economically vulnerable individuals in our region. All sponsorship registrations must be received by May 1, 2015. For more information on becoming a sponsor, please click here. You can contribute to Casino Night by making an item, gift card or cash donation for prizes and/or raffles. Your support will enable PA Women Work to continue to provide services for those women struggling in our region and help them to create a brighter future for themselves and their children. All donation forms must be received by May 1, 2015. For more information on making a donation, please click here.